Fleetwood Folk and Blues is a community based festival which takes places from the Friday to Sunday after August Bank Holiday. Each year the festival uses several venues across the town. For 2018 the venues are Fleetwood Bowling Club, North Euston Hotel, Strawberry Gardens, The Mount, The Steamer, The Bug, Glazey Days Craft Cafe and Fleetwood Museum. 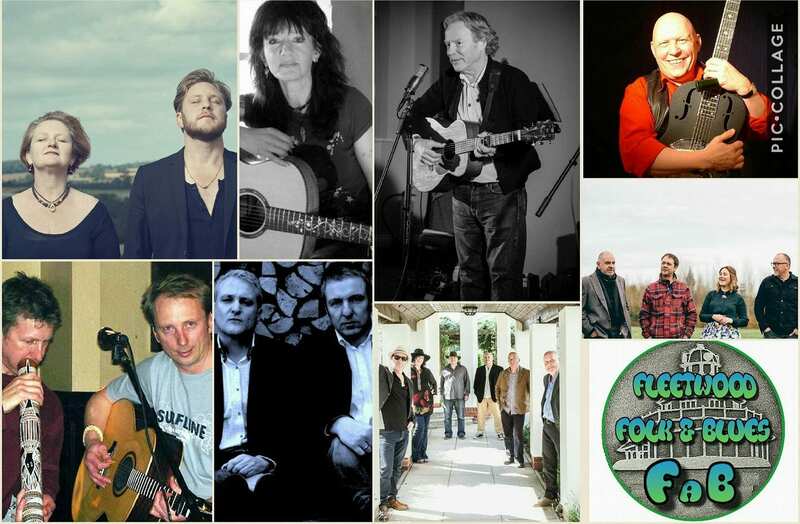 Fleetwood Folk and Blues brings a selection of International Artists to Fleetwood, our lovely picturesque coastal town with much heritage and natural beauty. 2017 – The success of Fleetwood FaB Weekend in 2015 and 2016 means that 2017 was another great year. 2016 – was an amazing year thanks to everyone’s hard work and support. In its second year, Fleetwood Folk and Blues Weekend boasted eight venues of live folk, acoustic and blues music alongside the return of the craft fair, workshops, meets and ceilidh. We also had a great success with our one day event in February, Folk Away the Winter Blues. Rachael Bailey, event organiser, was pleased to welcome Fleetwood Bowling Club for the main concerts and The Bug, musicians’ sessions. The return of the Strawberry Gardens and Steamer to the fringe venues ensured we had a folking great festival, doubling size from 2015. We were proud to present acts from Australia, USA, Ireland and Scotland as well as home grown talent. In 2011 Fylde Folk Festival was judged the Wyre tourism Event of the Year at the annual Wyre Tourism Awards. In 2007 it was awarded the Excellence in Tourism Award by Wyre Tourism Heritage Trust. Three thousand fans of folk music and dancing arrived in Fleetwood each year to see the concerts and displays spread around the town. Fylde Folk Festival was one of the biggest of it’s type to be held in the UK each year, and brings people visiting from all over the country. It was held at various venues around Fleetwood and is a celebration of Folk Music Song and Dance – one of Britain’s major Festivals with hundreds of top folk music artists from throughout Britain and North America – centred on the Marine Hall and featuring nearly 150 events, concerts, dances, music workshops, meet the artist sessions and much more. For forty years, Alan Bell and the Fylde Folk Festival brought Fleetwood to life, as thousands of folk music fans from throughout Britain and overseas flock to the town to sample its unique atmosphere and superb festival entertainment.